The Zero 6x9 Multi-Format comes with a basic camera, and an exposure scale pre-installed. All cameras come with an instruction manual, a serial number etched on brass plate, a certificate signed by our camera designer, and also includes a gift box. Price is US$172 plus shipping of US$34, for a total of US$206. The Deluxe Version package comes with the basic camera, exposure scale, cable release adaptor, service and bubble level spirit. Price is US$242 plus shipping of US$35, for a total of US$277. * Optional zone plate version is available, same price as pinhole version. * We ship worldwide. The shipping rate is the same for all countries. We accept major credit cards. Click on the "Order Now" button to submit your order now. The Zero 6x9 Multi-Format camera has become our best-selling camera since its launch. The camera was originally designed by our camera designer with a high-end CAD system. It is a 4-in-one camera, so that you can set the film format to 6x4.5, 6x6, 6x7 or 6x9. Simply select your preference before the film is loaded. Carry one camera instead of four!!! A truly unique addition to your collection of pinhole cameras. Get one today! Move your mouse over different parts of the camera to see more details. A simple shutter with low-pressure spring to prevent it from opening suddenly when carrying. The operation is smooth enough to avoid any vibration when opening or closing the shutter. We use 0.001" brass shim to make the pinhole conform to a more actual film stop number; and to render a sharper image. A Zone Plate version of the Zero 6x9 is also available. This camera works best with a mini tripod. Its 1/4" thread tripod socket allows you to adapt it to nearly all kinds of tripods available in the market. Center lock to secure the top cover of the camera in place. Practical design allows you to load and unload your film wherever you want. No dark room or changing bag is needed. Film advance knob with knurled diamond pattern. Single direction mechanism of the film winding button prevents the film from curling back. The structure and joints of the camera are specially designed, with reinforced bonding which allows the camera to shrink and to swell without affecting the performance of the camera when the weather changes. The mechanism and the structure of the camera make it work like an ordinary camera, but it is capable of taking extraordinary pictures! Our Exposure Scale helps you to calculate the exposure times more quickly with no need for a separate table. The polished brass displays a finely-etched rendering of the scale. You can set the film format to 6x4.5, 6x6, 6x7 or 6x9 before the film is loaded. This camera takes 16 frames when set to 6x4.5, 12 frames when set to 6x6, and 8 frames when set to 6x7 and 6x9. It's Collectible: A certificate signed by our designer will accompany each camera. 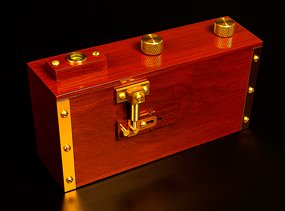 Every camera comes its serial number etched on a beautiful brass plate. All the pinholes are installed by our designer, Mr. Zernike Au, who also designed all our cameras and accessories. Every camera is checked and tested by him to ensure the highest quality. For the materials, we choose only high quality teak wood from Thailand. The wooden parts are first kiln-dried and then machine milled into correct size. Matte black paint is applied to the interior of the camera to prevent light leaks. More than 25 layers of coating is applied by hand to the camera, to insure maximum protection of the wood. We use hand-turned, solid brass for all metal parts. A baked color coating is applied to all the brass parts to prevent them from oxidizing. With our new bull's-eye bubble level spirit, you can have more control over angles and perspective when framing your pictures. It is made of solid brass and wood. Price of US$35 if purchased separately. Our specially-designed shutter mechanism will accept a cable release. You can trigger the shutter manually or with a cable release. Individual (non-package) price of US$69. 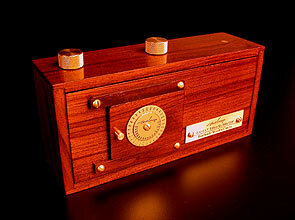 A must for speed pinhole photography!!! Imitations or copies of this item can be found in Birmingham of England. Please be advised we don't have any authorized dealers or manufacturers of our products in England. Don't be fooled by expensive imitations of our cameras!!! Upgrade your camera with practical additions, such as our unique cable release adaptor or our bubble level spirit . With our deluxe version package, you will not only able to have more control on framing and exposure time, but you will also save more than US$40. The film counter window allows you to know how many exposures are left. The window comes with a cover which works best for infrared photography, and also reduces the possibility of light leaks. The Zero 6x9 Multi-Format is a super-wide angle camera with a focal length of 40mm and it accepts 120 roll film. A take-up spool is provided. All you need to begin taking great pictures is a fresh roll of 120 format film. 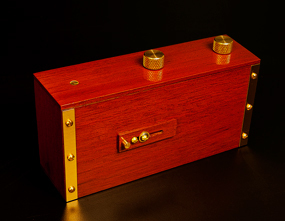 Compact size makes pinhole photography handier: 5 1/4"(w) x 3 1/4"(H) x 1 3/4"(D) and weighs only 250gm.